Where most coral reef studies take the close-up view of a diver, Coral Reef Airborne Laboratory (CORAL) will get the wide-angle view that comes with remote sensing instruments. 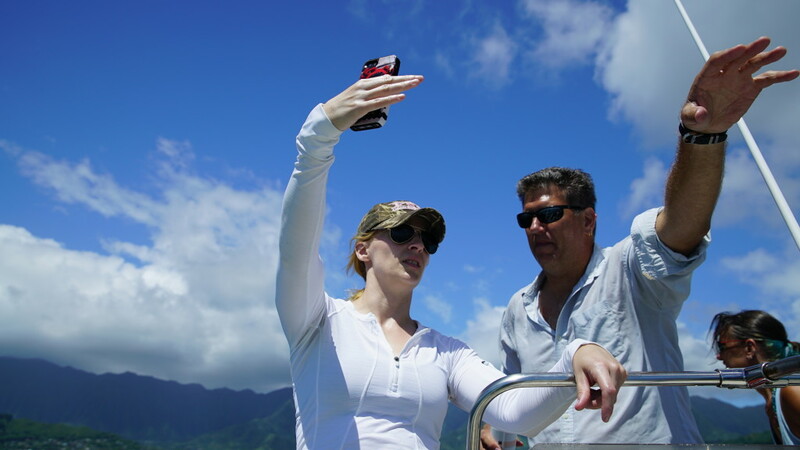 CORAL scientists Eric Hochberg, Bermuda Institute of Ocean Sciences, and Michelle Gierach, NASA Jet Propulsion Laboratory, talked about how their backgrounds and training prepared them for this ground-breaking mission. 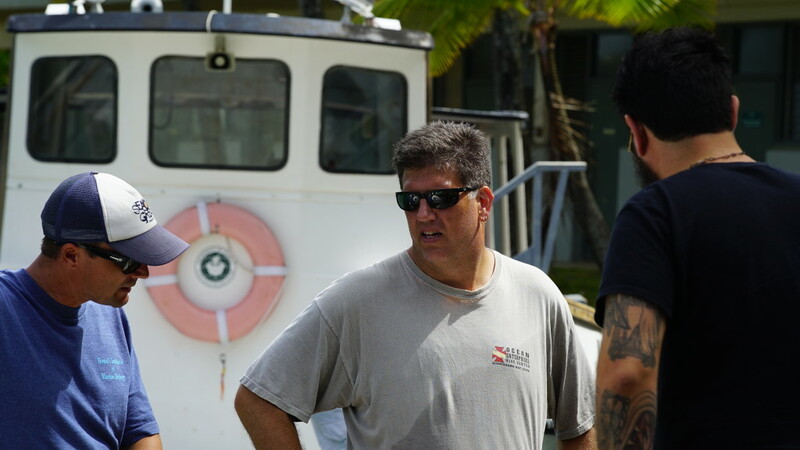 Eric Hochberg (center) and CORAL scientists preparing for boat operations at Kaneohe Bay on Oahu, Hawaii. Did you grow up near the ocean? I was born and raised in Tampa, Florida. Every year my father took us down to the Florida Keys to catch lobsters — “to try to catch lobsters” would be a better phrase. The whole family would spend a week on a boat, and I just loved it. Because of these experiences I started diving off the Florida Keys when I was 13 years old. When I got to college [Brown University], I thought maybe I’d be an engineer because I liked high school physics. Then I took college physics and said “No thank you.” In my junior year, I took a class in invertebrate biology and, from that moment, I wanted to be marine biologist. After college I lived in Taipei, Taiwan, for three years. I kept applying to grad schools, and on my third try I applied to the Department of Oceanography at the University of Hawaii. In the oceanography program my focus shifted away from “look at the pretty things” on a reef to trying to understanding reefs as an ecosystem. When did you get involved with remote sensing? I knew I wanted to do something with coral reefs in grad school, but I didn’t know exactly what it would be. My advisor, Marlin Atkinson, told me about a new technology program where they put a hyperspectral imager on an airplane and flew it over a reef. He thought it would fit me. It turned out to be a career-defining decision. I’m very fortunate that I got in at the beginning of the program. No one else [in the department] was doing spectroscopy of coral reefs. My committee included renowned planetary scientists and biogeochemists, and I was able to learn from these diverse people, but I was there on my own. That was a challenge because collaborations help you get new ideas. At the same time, it was a benefit because I had to learn everything myself. That made me a lot more self-reliant than I would have been if I’d been in a big lab with 10 other grad students. With remote sensing I see reefs as systems, not organisms. That’s a perspective that reef scientists often lack because of how they do their science. The science is very good, but it’s up close and personal. Remote sensing gives us a bird’s-eye view. What do you hope to learn from the CORAL mission? We’re worried about the future of coral reefs, and we have good reason to be. At the same time, I have seen reefs bounce back from major disturbances, and I have seen reefs that were not disturbed at all when we expected them to be. I have seen places where corals are growing and people say they shouldn’t even be there. Reefs are vast and spread out over wide areas of ocean. There are a lot of fundamental questions that we can’t answer yet because we haven’t looked at enough reefs over a long enough time. CORAL will give us a better chance to answer some of those questions. Did you always want to be an oceanographer? As a Floridian, I’ve always loved the water, but I actually started out as an aspiring TV meteorologist. Not just any meteorologist, but a Jim Cantore [from the Weather Channel] reporting live in the field during severe weather. Well, first I wanted to be Shamu’s trainer like most kids in Orlando, but by middle school I was determined to be a meteorologist. I went to Florida State University for their renowned meteorology program. My freshman year I had an internship at [a TV station] in Orlando. It was a fantastic experience, but I realized TV was not for me. Rather, I wanted to be behind the scenes answering questions about atmospheric processes that would improve weather forecasts — a weather caped crusader of sorts. My advisor at the time was a meteorologist and oceanographer, and he encouraged all his atmospheric science students to take oceanography classes and vice versa. The coupling between air and sea is so important that you really have to have an understanding of both. One particular class I took that got me thinking about oceanography as a career was satellite oceanography. It was intriguing to me that there was a suite of satellites informing us about different components of the Earth system. You could say this is where it all started. My master’s thesis used satellite observations to develop a technique to detect and monitor the early stages of tropical cyclone formation, and my Ph.D. dissertation [at the University of South Carolina’s Marine Science Program] used satellite observations and models to assess the ocean response to tropical cyclones. I may not have known it at the time, but I was already destined for NASA and the Jet Propulsion Laboratory. What is it you like so much about satellite observations? I love the synergies, taking multiple observations to say something about a particular topic. If you look at an eddy, for example, from the Jason series [of satellites] you see it as elevated or depressed sea surface height. From a different satellite you get a chlorophyll-a response in its core or around its periphery, and from a third one you get a sea surface temperature response. Combining these observations tells a story about the transport of heat and carbon by eddies. One of the great things about NASA is that all data are publicly available. This increases data visibility and usability to a larger community, increasing the opportunity for new measurements and science to be discovered, ultimately improving our understanding of the Earth system. You’ve done quite a few field campaigns. How do you like field work? When I got out of grad school I had only done remote sensing. I love it, but you always need some kind of validation to make sure that what you’re seeing is correct. For my postdoc [at the University of Miami’s Rosenstiel School of Marine and Atmospheric Science] I wanted to witness firsthand what it takes to get those observations, as well as earn the right to call myself a seagoing oceanographer. They did withstand the typhoons and took observations. If you were to look at a global map with just those two [data points], they look like nothing, but seeing the work it took to get those two … it definitely took a village. I liked going to sea and was glad I had done it, but I realized that’s not the life for me. Remote sensing is my wheelhouse. I’m going to stick with it. What are you most looking forward to in CORAL? Seeing all the moving parts come together. There’s beauty to that. Also, seeing if the results confirm the held assumptions that coral reef cover decreases with increasing ocean temperature and increasing marine pollution, or if they tell us something entirely different. The next steps beyond CORAL are also exciting. Is there additional information that can be extracted from the remote sensing data to further understand reef ecosystems and their environment? Can we take the next leap toward a dedicated, spaceborne mission to provide monitoring of coral reef ecosystems with greater spatial and temporal coverage? The CORAL mission, and the steps to follow, will take us to new heights in understanding.